An effective quality system should save work, not make it. And systems designed for everyday use should help people work faster over time, not get in their way. Quality Systems built on TeamPage streamline communication by working in context. 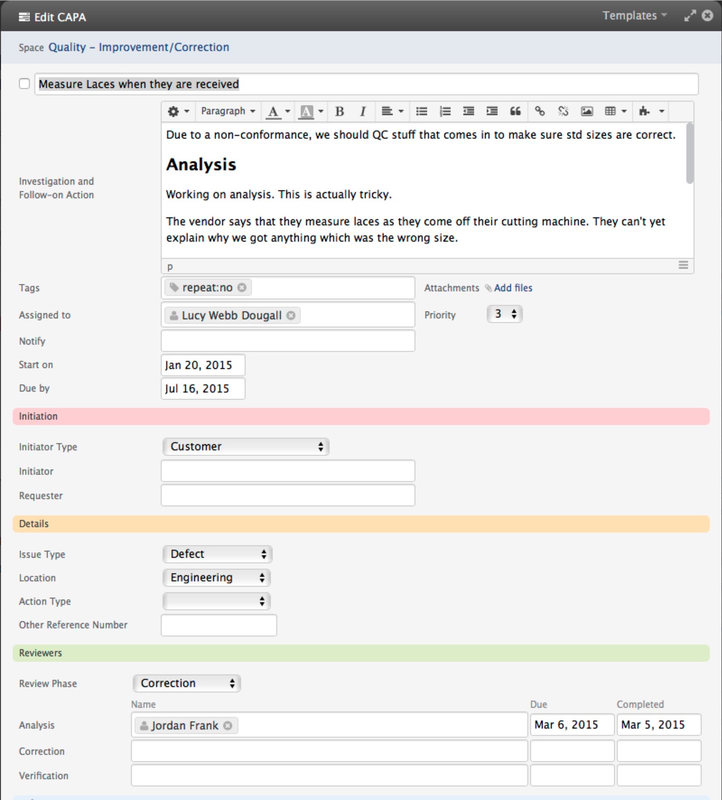 TeamPage makes it easy for everyone in your organization to use your quality documents. Moderation and approval controls ensure that people are working from the current document, and TeamPage's comments and tasks make it easy to keep quality documents up-to-date. Simple forms help you track Feedback, Non-Conformance, Corrective and Preventative Actions (CAPAs), Improvement Opportunities and Projects, as well as ISO 9001:2015 Risk and Improvement Actions. Signature Requirements help people keep track of, and sign off on, documents they need to review, approve, or just read. Graphical dashboards with live filtering give you a bird's eye perspective of quality activities throughout your organization. 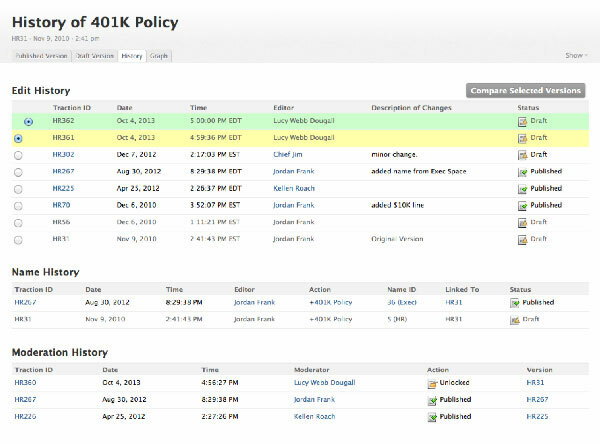 Interactive tables let you dive into the details to see the latest follow-up on ongoing actions. And TeamPage's comprehensive and easy-to-follow audit trails make answering questions during ISO audits fast and easy. 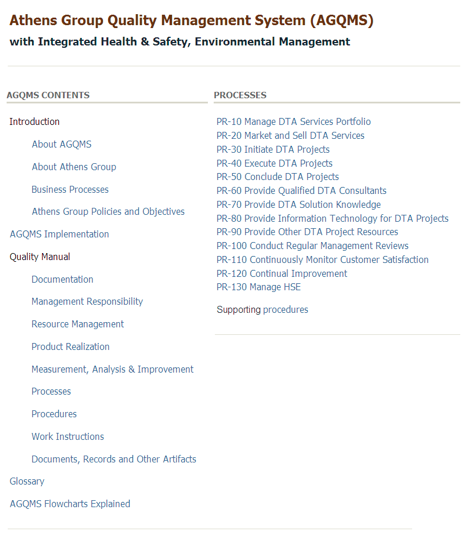 Documentation is at the core of ISO 9001 quality systems. It communicates how your business operates. But business that continuously improve also continuously change. And so, therefore, must the documentation. TeamPage helps you keep your Quality Manual and all of its SOPs, Work Instructions, and other documentation current, accurate, and available. You can author your quality documents directly in the TeamPage editor, attach formal documents written in Word, or even link to documents and pages where they already live in other Content Management or Quality systems. Whichever approach you take, TeamPage makes it quick and easy for people to find the right version of the document they need, to suggest corrections and updates, and to stay informed about the status of those changes. Your Quality Team decides when changes to a document are published to the organization. Until then, only the people they designate, for example reviewers, can see the draft version of the document. When it's time to follow a procedure, templates and checklists make it simple to ensure that the procedure is executed correctly each time, with each step being checked off as it's completed. And if any problems or exceptions arise, comments and tasks, including photographs, can be created directly in context, simplifying and streamlining the reporting and resolution processes. TeamPage helps your organization to follow its documented processes. And when exceptions arise, the next step is just a click away. From simple checklists to standard projects, TeamPage makes it easy to track your progress through a process, to repeat the same process consistently, and to modify and share the process when it changes. Making sure that people know about important changes to processes can be a difficult process to manage. Who has read the document? Did it change since they last read it? Did the necessary people approve it before it was published? TeamPage makes managing this easy by letting you attach one or more Signature Requirements to any document. Signature requirements say who needs to sign off on the document, for what purpose, when, and how frequently. TeamPage then takes care of reminding people when they need to review the document, or execute the procedure described in it. And in case a friendly reminder is needed, it makes it easy for managers to see who in their group has and hasn't caught up. TeamPage lets you customize your CAPA and other forms to match your processes perfectly. Standard Operating Procedures work until something unanticipated occurs. That's when your customers, shop workers, engineers, operations and quality managers need to post and track the Feedback, Non-Conformances and CAPAs required to identify, understand and resolve the root causes underlying quality problems. TeamPage's customizable forms make it easy for people to provide exactly the information that you need to manage your investigation and follow-up effectively. And if one action leads to another, e.g. if a Non-Conformance leads to a Corrective Action, the relevant information and context from the Non-Conformance is automatically carried over to the Corrective Action. Naturally, with TeamPage at the center of your quality processes, all the right people are automatically kept in the loop. Whether you're fighting fires or working through an external ISO audit, TeamPage's live report views give you the insight you need when you need it. TeamPage has a variety of Dashboard views to give you up-to-the minute insight into quality processes throughout your organization. 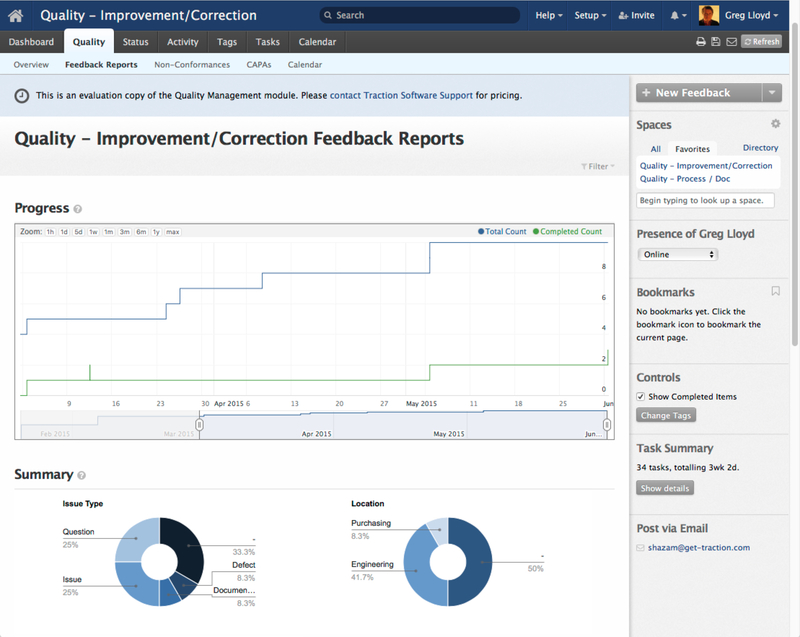 For example, the Feedback dashboard lets you explore ongoing and historic feedback reports and their resolutions. Click the chart segments to filter the dashboard and interactive table view. Dashboards can also contain dynamic tracking tables that update as you filter and explore the ongoing activity, and which also let you expand and interact with the detailed information underlying the table summary. When it's time to look back, TeamPage makes it easy to see and share where you've been. The history panel shows a complete audit trail of all changes to documents. Ready to lower the pain and cost of ISO compliance? 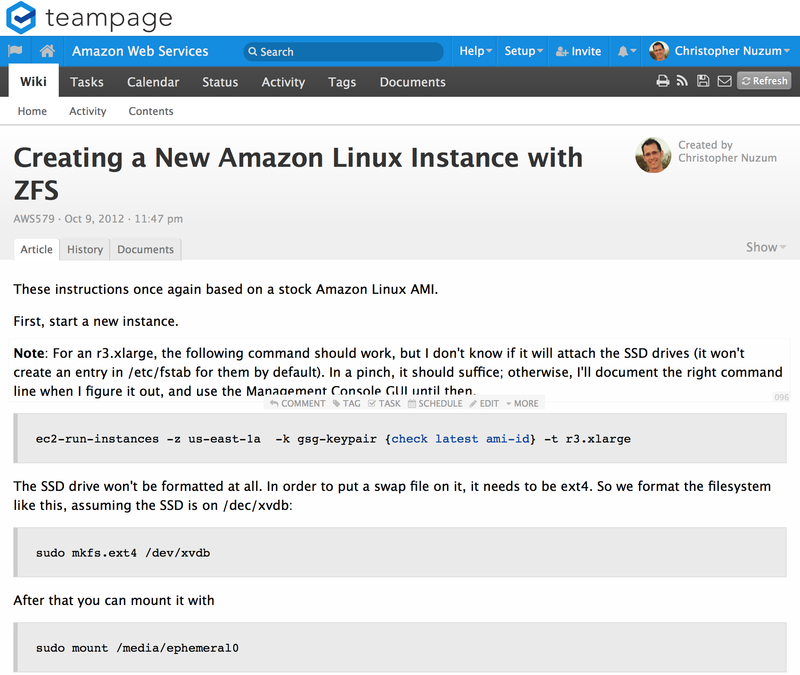 Try TeamPage!